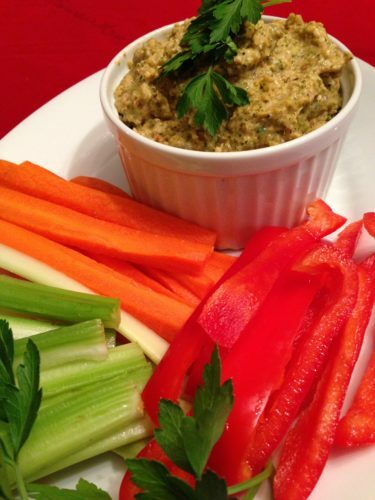 Heart Healthy Roasted Broccoli Dip. 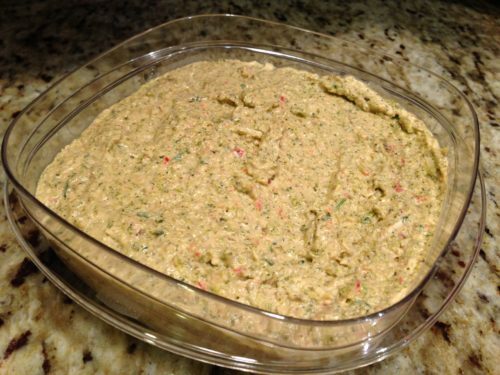 After watching the documentary “Forks Over Knives” recently, I read Dr. Caldwell Esselstyn‘s book “Prevent and Reverse Heart Disease.” My Roasted Broccoli Dip recipe should hopefully meet all of Dr. Esselstyn’s requirements for a real “heart-healthy” dip for veggies or as a spread for whole grain breads. 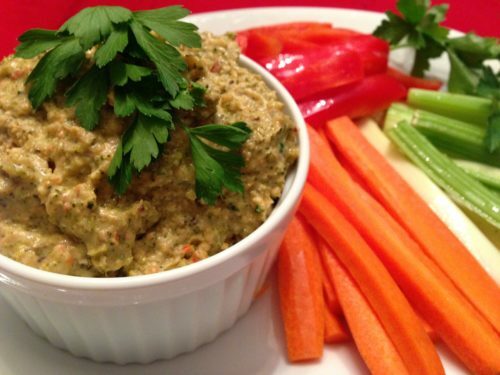 Due to roasting the broccoli, this dip is nutty-tasting without containing any nuts. Several of my long-time friends have been diagnosed with heart disease or are prone to it. We lost my father-in-law to a stroke a few years ago. Heart disease runs in my side of the family, too. It was interesting to find out that even people who “appear healthy” and are active may have severely blocked arteries and not even know it! Dr. Esselstyn’s heart disease patients follow a fairly strict plant-based diet with no plant-based oils, nuts, avocados, or coconut. The diet also contains no animal products which means no meat, fish, fowl, dairy, or even eggs. The diet DOES allow all vegetables and fruits (except avocados), whole grains and legumes. If patients have not been diagnosed with heart disease, they are permitted a small amount of walnuts in their diets. Many of Dr. Esselstyn’s patients were given “no hope” and only several months to live after major heart surgeries and still very blocked arteries. 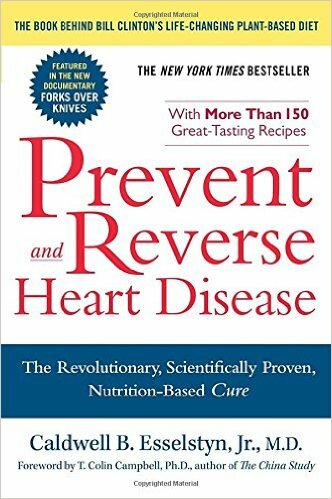 In his study, Dr. Esselstyn was able to prevent and even REVERSE heart disease in his patients who followed his strict diet! I’m intrigued because heart disease is also known as the “silent killer” so an affected person may have no symptoms at all. And I’m a firm believer that quite a number of foods in our diets are the cause of modern day diseases. Many foods that are widely advertised as “heart-healthy” are not heart healthy at all. When you read about Dr. Esselstyn’s plant-based diet and his research, you’ll find that even “heart-healthy” olive and coconut oils contain saturated fat which is different than animal fat but still fat nonetheless. And that even plant-based saturated fat can clog arteries. 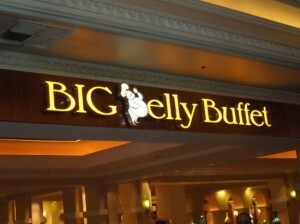 My husband and I have been on a “healthier eating” path for a few years now. 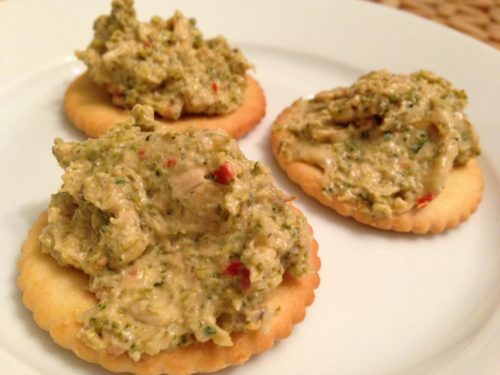 Tasty recipes like my Heart Healthy Roasted Broccoli Dip will certainly help us meet our goals. Back to my Roasted Broccoli Dip. Start out by roasting some broccoli florets and then chilling them for a few hours. Then, in a food processor with the metal blade, combine the roasted broccoli with red bell pepper, scallions, garlic, red pepper flakes, cannellini beans, chopped parsley and cilantro, and optional nutritional yeast. Pulse a few times and then process until smooth. If the dip is too thick, you can add some water and pulse on and off a few times. Season the dip with salt and pepper, and serve! 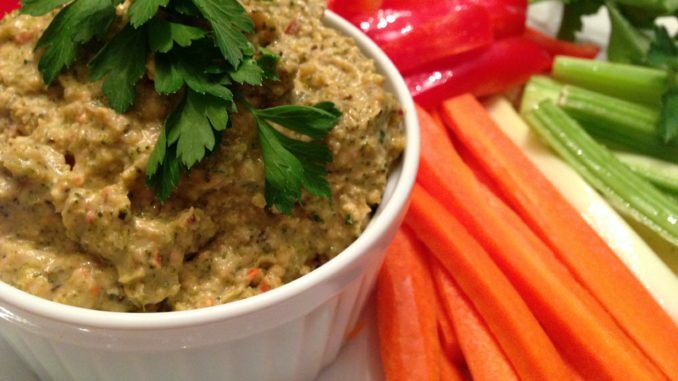 This dip tastes great chilled, at room temperature, or warmed in the oven. 2. Wash the broccoli florets. 3. Spread the broccoli florets over a parchment or Silpat lined baking sheet. 4. Roast the broccoli for 15 – 20 minutes or until it starts to brown slightly, stirring every so often. Don’t over-roast or the broccoli may taste burned. 5. Remove from oven, let cool to room temperature, and chill for a few hours in the refrigerator. 1. Combine all items in food processor. 2. Using pulse speed, pulse ingredients together several times, stopping to push sides down with spatula. 3. Run food processor at “on” speed until the mixture is creamy and has thickened. 4. Add a bit of water if the consistency is too thick. 5. 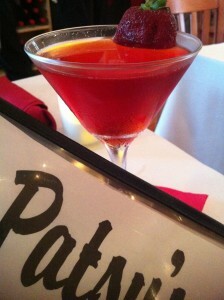 Pour into a serving bowl and serve! Makes about 3 cups of dip. Offer with pita triangles, carrot and celery sticks, or whole grain crackers. 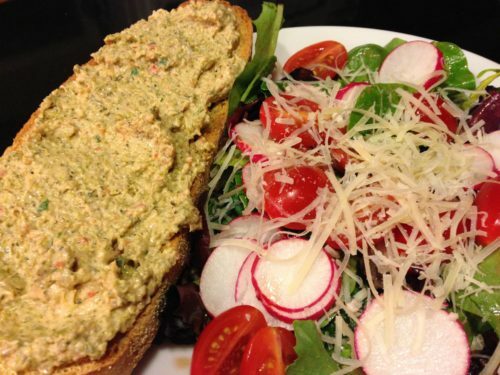 Use this spread instead of mayonnaise or mustard on a sandwich. This dip freezes well. Variations: Substitute garbanzo beans for the white beans. Add some roasted bell pepper instead of the raw bell pepper. Instead of serving the dip chilled or at room temperature, warm the dip in the oven at 350 degrees Fahrenheit until the center is hot.